Given the limited amount of space available on mobile devices, it’s no wonder that marketers don’t want to waste the prime real estate at the top of emails. MailChimp recently sent a marketing email promoting their new dashboard. 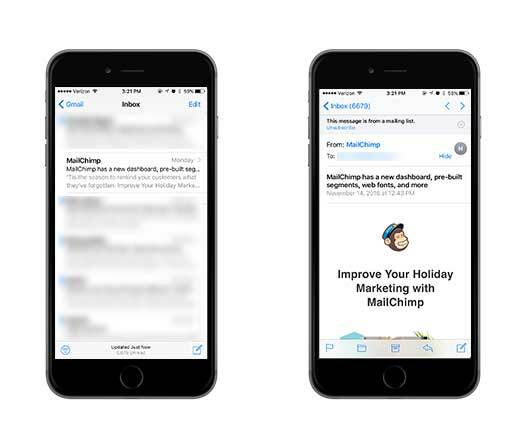 In the image on the left of a mobile email client, you can see the teaser text. However, it’s not visible in the image of the email content on the right. The line is actually in the email body, but it’s hidden from the display using CSS. The result is a clean layout with no distractions. Litmus currently reports the iPhone as the email client with the highest market share2. Thanks to iOS 10, we now have a big gray bar at the top of our marketing emails telling us “This message is from a mailing list”. This means we now have even less space to work with in our email layouts. The verdict: If the teaser text doesn’t enhance the user experience, hide it! What About “View in Browser” Links? You’ll notice that the ‘view in browser’ link is also omitted from Mailchimp’s email above. In the dark ages of HTML emails, email client support was certainly a challenge. We all did our best, but for the stragglers still using ancient software (I’m looking at YOU, Outlook 2003), we added a link to view the email as an HTML page. …But is it still necessary? Because of the high percentage of mobile email opens, many marketers are opting for simple layouts that look great on any device, email client and browser. Plus, email client support continues to improve. Usage – how many users have been clicking the link? The Verdict: If your email is simple, and little or no users have been clicking the link, there are better ways to use that space.